The decision by Rockstar, the developers behind Grand Theft Auto, to create a ping pong game has taken many by surprise. There are no guns, no fast cars and no prostitutes, just two bats, a ball and a net. Instead of a sprawling city to explore, this game gets close up and personal. But Table Tennis for the Xbox 360 proves an unexpected delight - fast, frantic and fun. This is the first game by Rockstar for the next generation of consoles. The developers are already working on a new version of their genre-defining Grand Theft Auto series. But this will not see the light of day until late next year. Instead, Rockstar's first steps into the next generation gaming world is a sports title for Microsoft's Xbox 360. The beauty of table tennis is that just about everyone understands the premise of the game. This is pretty much the case in the 360 game. You can simply slip the disc in the machine, wait a few moments for the game to load and start playing. At first, Table Tennis appears deceptively easy as any of the buttons will produce a shot and the direction is set by moving the joystick left or right. Beneath this veneer of simplicity lies a sophisticated control system. 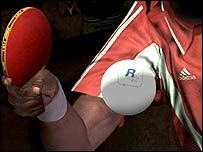 A short training module helpfully explains the types of shot associated with each button, such as topspin or backhand. The longer a button is pressed down, the more powerful the shot. Similarly, vibrations in the joystick act as a warning sign that you may overshoot the table. There is also what Rockstar have called a focus mode. As you play, this builds up to create more powerful shots. This technique is beautifully executed in the game, with the shot being shown in slow motion. This may sound like it would interrupt the flow of a match. But it somehow manages to convey the tension in key moments of a heated exchange. One other key part of the gameplay does not work quite as well. Each shot is colour-coded to match one of the buttons on the 360 controller. The aim of this is to return the shot using the same colour in order to score a point. This seems a good idea but proves difficult in practice, as it is hard to spot the colour as a ball speeds towards you. Rockstar have turned their backs on the trend towards allowing gamers to style every element of your on-screen alter-ego. Instead, players can choose from 11 characters with a range of skills and styles and compete in 15 international arenas. It makes for a welcome change and makes it easier and quicker to get to the action. In single-player mode, gamers can try their hand at tournaments to unlock additional players and goodies such as new outfits. But there is also the opportunity to pit your skills against the world via Microsoft's online gaming service, Xbox Live. It is easy to see the appeal of challenging friends online and earning bragging rights after a closely-fought match. Table Tennis is a slick and polished title. The only reservation that springs to mind is about the long-term appeal of the game. For all its gloss, this is after all ping pong. It is uncertain whether the legion of Grand Theft Auto fans will embrace this game with the same fervour. Table Tennis might end up being the sort of thing you pick up from time to time for a few games or to test your skills against a mate via Xbox Live. Rockstar seems to have factored this in as the game is expected to retail for around £30, well below the cost of other Xbox 360 titles. At that price, many gamers may be tempted to add ping pong to their range of interests.